I have the privilege and pleasure of working with many, many very poor Afghan children and the sign you see above epitomizes their attitude. 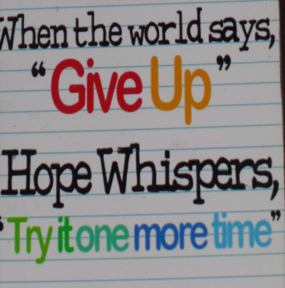 Talk about inspiring! Local Afghans wishing only for peaceful and secure lives like you and I take for granted have had uphill battles for the past 40 years – most of the population doesn’t even know remember when their country was not at war. And today, that uphill battle is steeper. The economy is severely depressed, jobs are scarce, the insurgency is making inroads and the majority of people are uneducated. 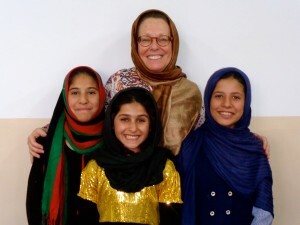 Over the week I spent in Kabul at the beginning of October, I saw and spoke with the many of the over 50 children whom ZAANHA is now sending to school and I wanted to highlight 2 of them as well as give you an update on Roya’s School. Their “before” stories are representative of the hundreds of thousands of children who work on the streets to help support their families. The remarkable progress they’ve made in the short time they’ve been in school is inspires awe. I hope you too will be moved by their stories. Shugufa used to get up at 5am to get ready for public school which she attended from 6am–9:30am. Afghan public schools are so crowded that they are divided into 3-1/2 hour sections and there are sometimes as many as 50 children to a class. After school she went home to change and then went out to collect cardboard and papers and the wooden sticks people use to make fires for their ovens. In the afternoon she went to Aschiana for an English class and then home to do her homework, help her mother with dinner, eat and go to bed. Her parents are illiterate and she has 1 sister and 3 brothers. The family lives in one room that they rent. Her father repairs shoes and her mother takes care of the children. Shugufa started at in ZAANHA Fund’s private school program almost 2 years ago. She had been in the 5th grade in public school, but was so far behind her Rumi School classmates that she had to go back to the 1st grade. She was in an accelerated program, learned quickly and is now in the 3rd grade. You can’t imagine my gratification when I discovered that she is now completely literate in Dari, her native language,and is learning to read and write English. She was even able to speak a little. Her mother told me Shugufa now studies all the time when she is at home. When relatives visit, they are impressed and even a little envious at how literate she is and at how educated she is becoming. Doesn’t begin to describe the pride her parents feel! I remember meeting Yasin 3 years ago. At that time, he was shy and reserved.The Director of Aschiana, Nazar, told me Yasin was a gifted child and would be a great candidate for ZAANHA’s private school program. He started at Rumi and then dropped out because the commute was long and he didn’t have friends there. For a while he didn’t go to school because his family left Afghanistan. They returned over a year ago and Nazar asked me if we could send Yasin to a private school in his area. Flash forward to my Kabul visit earlier this month. Yasin confidently strode into the conference room. He shook my hand and asked in excellent English how I was and if I was enjoying my stay in Afghanistan! I was stunned! He then proceeded to tell me “If a person doesn’t know about knowledge, he is nothing”. Incredible for a boy who is now 11 years old and illiterate only a few short years ago. He is now 11, in the 6th grade and ranks 1st in his class. 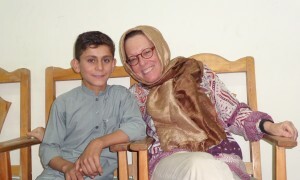 He wants to learn to use a computer and take lessons – ZF will buy a computer for him and provide the funds to take special classes. Stay tuned for more about Yasin! Roya’s School was started in a small village about an hour outside of Kabul over 3 years ago with 6 girls who wanted to learn English and computers, but were not allowed to go by themselves to central Kabul where there were classes. Roya, who lived in the village and graduated from Kabul University with a degree in computer science, became the teacher and we were off to the races! 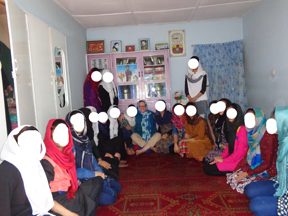 13 girls have now graduated from Roya’s School and 2 of them were admitted to Kabul University because they had computer skills and English training. Roya got married in early September and moved to Mazar e Sharif in northern Afghanistan. She is starting the Mazar branch with 10 students. Hadiesa, one of the original students and now attending a special school with advanced English courses, will take over Roya’s position in Kabul with 10 new girls. The girls who have graduated are recruiting 2 new girls each who want to learn computer basics and are teaching them. Is there any better way to reinforce what they’ve learned as well as to hone leadership skills?